‘Greeting June the “Month of Defending the Country and Rewarding Veterans,” the New Life Welfare Foundation visited the Veterans Hospital in Seoul. 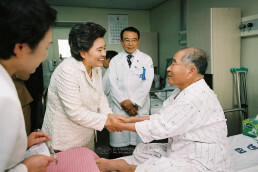 The Veterans Hospitals are located in five metropolitan cities such as Seoul, Busan, Gwangju, Daegu and Daejeon, where wounded soldiers and police officers, and the veterans are treated and rehabilitated; the veterans were suffering from various diseases, injury and aftereffect that they got when they fought at the risk of their lives during the Korean War and the Vietnam War. The patients, who spent half of their lives on sickbeds with the disabled bodies, smiled and said, “Thank you for not forgetting us.” We were able to learn patriotism through them who had been persevering and soothing their physical pains with patriotism and pride. This visit was also meaningful in that we thought about the misery of war which is fading away in our daily lives in peace. We wish all the veterans, who sacrificed themselves for the country, to be healthy and happy.